An early warning system with a risk-based approach for drought assessment in the Bolivian Altiplano was established using satellite imagery data focusing on ENSO phases. During warm ENSO phase resulted a great difference in risk and crop yield. ENSO early warning forecasts and possible crop deficits could be established, including the identification of hotspots for the growing season. Our approach could lead a proactive approach for drought management that can include risk reduction instruments. In order to evaluate the future water availability in an artificial recharge area located in arid Iran, different climate and water management scenarios were applied. This was done through the simulation of surface water and groundwater by numerical modeling. The results showed that the pumping scenarios have the most substantial effect on groundwater level and continuation of current pumping rate would lead to a total depletion of the aquifer in the upcoming decade. In this study, Freshwater Lake Model simulation results, verified by satellite and buoy observation data, were used to quantify the recent climate change effects on the thermal regime of the largest lake in China. Results indicate that the FLake model can nicely reproduce the lake thermal pattern. The lake surface is warming while the lake bottom has no significant trend. The climate change also caused an earlier ice off and later ice on, lead to an obvious change on the energy balance of lake. Description of thermal regimes in flowing waters is key to understanding physical processes and improving bioassessments, but has been limited by sparse data sets. Using a large annual temperature data set from a mountainous area of the western U.S., we explored thermal regimes using principle component analysis. A small number of summary metrics adequately represented most of the variation in this data set given strong temporal coherence among sites. Lake Victoria is the largest lake in Africa and one of the two major sources of the Nile river. The water level of Lake Victoria is determined by its water balance, consisting of lake precipitation and evaporation, inflow from rivers and lake outflow, controlled by two hydropower dams. Here, we present a water balance model for Lake Victoria, which closely represents the observed lake levels. The model results highlight the sensitivity of the lake level to human operations at the dam. Lake Victoria is the second largest freshwater lake in the world and one of the major sources of the Nile River, which is controlled by two hydropower dams. In this paper we estimate the potential consequences of climate change for future water level fluctuations of Lake Victoria. 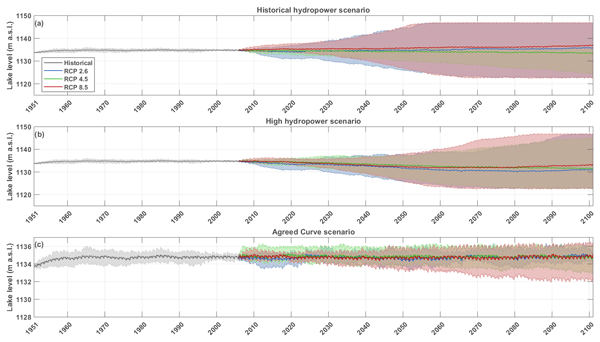 Our results reveal that the operating strategies at the dam are the main controlling factors of future lake levels and that regional climate simulations used in the projections encompass large uncertainties. Lakes and reservoirs can affect local weather regimes but usually it is difficult to trace and assess it. In this work we used the Meso-NH atmospheric model to study the impact of the Alqueva reservoir, one of the largest artificial lakes in western Europe, located in the southeast of Portugal, on meteorological parameters and the formation of a lake breeze system. The magnitude of this impact as well as the intensity of the breeze are shown in the paper. Permanent gullies are deep steep-sided channels that erode as water falls over the upstream end. Erosion of these features is a concern where people and climate change have altered how water moves over the land. This paper analyzes a set of experiments that were used to determine how changing gully flows impact erosion. We found that while increasing the volume of water will increase erosion, changing the flow rate into gullies will not impact the total erosion, but will alter gully shape. Our interest is focused on developing the hydrophone technique to estimate the size of particles transported in rivers. The analytic spectral solution of the impact between rigid particles is used to model the power spectrum of a sediment mixture, or the sediment-generated noise. 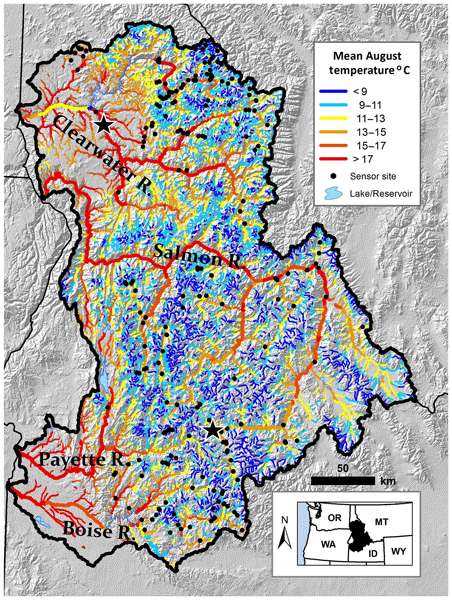 Estimations of grain size distributions in the Isère River using real measured spectra are successfully validated by the physical sampling techniques. Moreover, the grain size sorting process is revealed by acoustics. 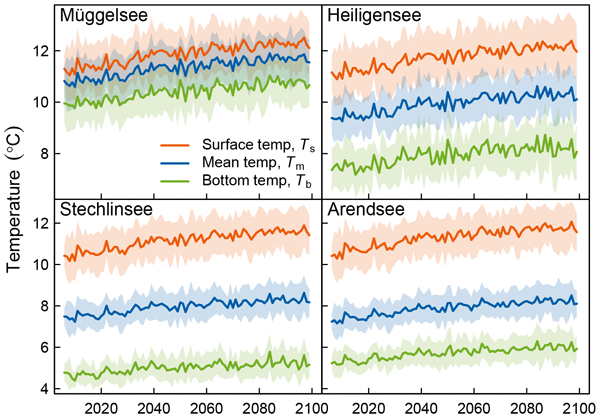 Responses of inland waters to climate change vary on global and regional scales. 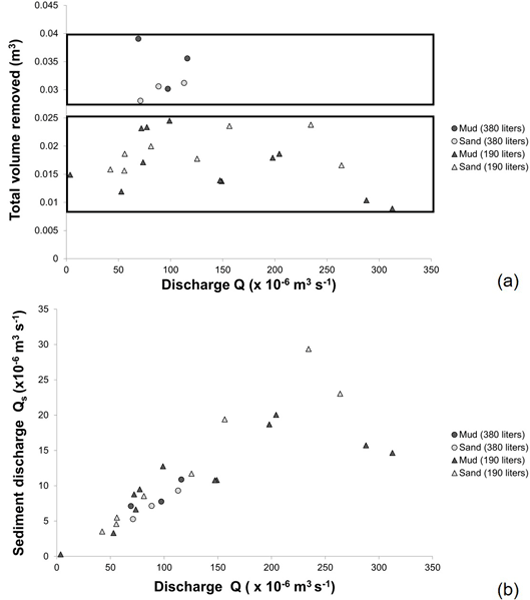 Shifts in river discharge regimes act as positive and negative feedbacks in influencing water temperature. The extent of this effect on warming is controlled by the change in river discharge and lake hydraulic residence time. A shift of deep penetrating river intrusions from summer towards winter can potentially counteract the otherwise negative climate effects on deep-water oxygen content. Lakes are sentinels of climate change, and an adequate characterization of their feedbacks to the atmosphere could improve climate modeling. These feedbacks, as heat fluxes, can be simulated but are seldom measured, casting doubt on modeling results. Measurements from a small lake in Canada established that the model parameter modulating how much light penetrates the lake dominates model response. This parameter is measurable: improved monitoring could lead to more robust modeling. 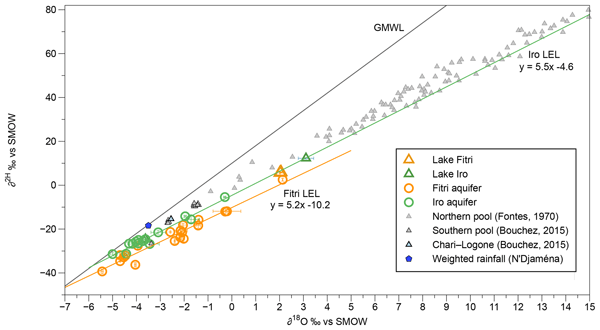 Water temperatures and stratification in three morphometrically different lakes over the century are examined. 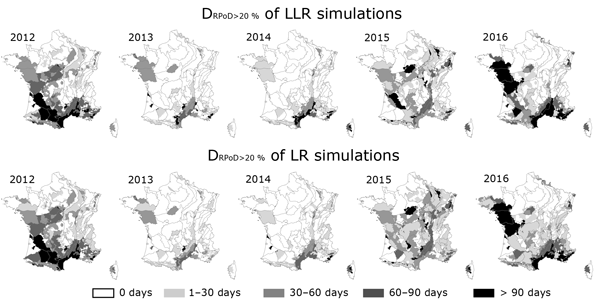 Simulations showed that epilimnetic temperatures increased, hypolimnetic temperatures decreased, the length of the stratified season increased due to earlier stratification onset and later fall overturn, and stability increased. Results showed that wind speed has a large effect on temperature and stratification variables, sometimes greater than changes in air temperature. The Huangpu River, an important river of the basin connecting Lake Taihu upstream and the Yangtze River estuary downstream, drains two-fifths of the entire basin. Constructing an estuary gate is considered an effective solution for flood mitigation. The main objective of this paper is to assess the potential contributions of the proposed Huangpu Gate to the flood control capacity of the basin. Results of quantitative analyses show that the Huangpu Gate is effective at evacuating floodwaters. This research proposes a new method for determining efficient and effective synthetic initial conditions for an unsteady model using the Saint-Venant equations for a large river network. The proposed method increases the efficiency of initial condition convergence up to 3700 times. This can not only help the hydrology research move from empirically based to mechanistic-based models for large river networks but also provide a computationally effective approach for initial conditions for modelers. Can spatial statistical river temperature models be transferred between catchments? River temperature (Tw) is important to fish populations, but one cannot monitor everywhere. Thus, models are used to predict Tw, sometimes in rivers with no data. To date, the accuracy of these predictions has not been determined. We found that models including landscape predictors (e.g. altitude, tree cover) could describe spatial patterns in Tw in other rivers better than those including air temperature. Such findings are critical for developing Tw models that have management application. We report a first description of the seasonal temperature, mixing, and ice regime in the two largest freshwater lakes of the Tibetan Plateau. We perform a validation of lake model FLake for the parameterization of the Tibetan lake system in regional climate models and present evidence of the absent warming trend in the Tibetan lakes despite significant atmospheric warming. The reason for this unexpected behavior is the significant decrease in solar radiation at the surface. Density calculations in lakes are essential in the study of stability, stratification and numerical modelling. However, density equations which use fixed constant coefficients are still common in use, despite their limitations. We present a practical approach which can specifically include the effect of dissolved substances by fitting two coefficients. The method has been tested against density equations and density measurements in lakes. This paper employs a one-dimensional hydrodynamic ice model to simulate ice cover and thermal structure of dimictic Lake Mendota, WI, USA, over a continuous 104-year period (1911–2014) with the purpose of better understanding how the changing climate will affect lakes. It is shown that air temperature and wind speed changes have occurred in stages and ice cover and lake thermal structure have responded in a nonlinear way to these changes. 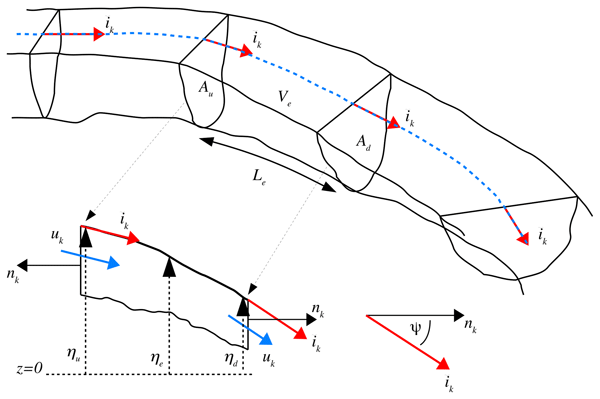 We present two new methods for uniform flow computation, named LHRM and INCM. We also present the calibration and first validation from laboratory experimental data, second validation by field discharge hydrographs estimated by measured water level data, and the third validation from a 3-D solution of CFX code applied to a reach of the Alzette River. Hydrological data collection is a challenge for the scientific community, especially as some events e.g. floods occur in un-gauged rivers or infrequently. Some such events are however recorded by satellites. Using satellite remote sensing in estimating surface water parameters has its limitations, but recent improvements in sensor specifications, expansion in research methods and knowledge of satellite data have increased its utilization. The review is on modelling and mapping with RS. We disentangled two major factors that affect lake water quality, namely the meteorological conditions and loading from the catchment. In previous studies, distinction of these two major factors was not always sought. However, from the management point of view, quantifying these two factors may be of interest, for example because the managers may want to evaluate the effectiveness of an abatement plan that reduced catchment loading despite the unfavourable meteorological conditions. In this study, we used the MESAW statistical model to estimate the surface water N retention. Such large-scale estimates are lacking for the Baltic Sea and there are only a few studies of this globally. Our results show that around 380 000t of N are annually retained in surface waters draining to the Baltic Sea. The total annual riverine load from the 117 basins to the Baltic Sea was estimated at 570 000t of N, yielding a total surface water N retention of around 40%. Abarca-Del-Río, R., Crétaux, J. F., Berge-Nguyen, M., and Maisogrande, P.: Does Lake Titicaca still control the Lake Poopó system water levels? 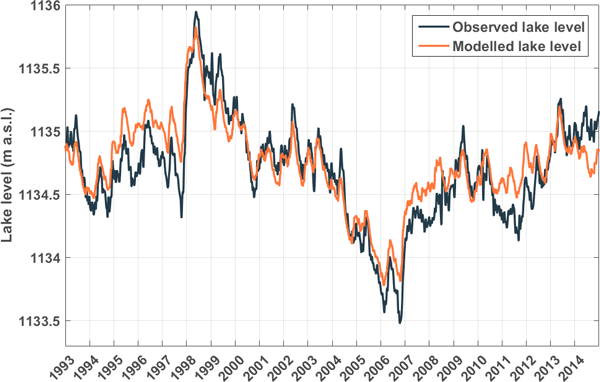 An investigation using satellite altimetry and MODIS data (2000–2009), Remote Sens. Lett., 3, 707–714, https://doi.org/10.1080/01431161.2012.667884, 2012. Bengtsson, L., Herschy, R. W., and Fairbridge, R. W.: Encyclopedia of Lakes and Reservoirs, Springer Dordrecht, ISBN-13: 978-1-4020-5616-1, 2012. Boulange, B. and Aquize, J. E.: Morphologie, hydrographie et climatologie du lac Titicaca et de son basin versant, Rev. Hydrobiol. Trop., 14, 269–287, 1981. Bowen, I. S.: The ratio of the heat losses by conduction and by evaporation from any water surface, Phys. Rev., 27, 779–787, 1926. Canedo, C., Pillco, Z. R., and Berndtsson, R.: Role of hydrological studies for the development of the TDPS system, Water, 8, 1–14, https://doi.org/10.3390/w8040144, 2016. Carmouze, J. P.: The energy balance in the Lake Titicaca, in: A Synthesis of Limnological Knowledge, edited by: Dejoux, C. and Iltis, A., Kluwer, 131–146, 1992. Carmouze, J. P., Arce, C., and Quintanilla, J.: La régulation hydrique des lacs Titicaca et Poopo, Cahiers ORSTOM, Série Hydrobiologique, XI, 269–283, 1977. CMLT: Comisión multisectorial para la preservación y recuperación ambiental del Lago Titicaca y sus afluentes, Estado de la calidad ambiental de la cuenca del Lago Titicaca ámbito peruano, CMLT, 152 pp., 2014. Crawford, T. and Duchon, C. E.: An improved parametrization for estimating effective atmospheric emissivity for use in calculating daytime downwelling long-wave radiation, J. Appl. Meteorol., 38, 474–480, https://doi.org/10.1175/1520-0450(1999)038<0474:AIPFEE>2.0.CO;2, 1999. Dalton, J.: Experimental essays on the constitution of mixed gases, Manchester Literary and Philosophical Society Memo, 5, 535–602, 1802. Dejoux, C. and Iltis, A. (Eds. ): Lake Titicaca, A synthesis of Limnological Knowledge, Springer Science, Kluwer Academic Publisher, 1992. Delclaux, F., Coudrain, A., and Condom, T.: Evaporation estimation on Lake Titicaca: a synthesis review and modeling, Hydrol. Process., 21, 1664–1677, https://doi.org/10.1002/hyp.6360, 2007. FAO: The state of the world's land and water resources for the food and agriculture (SOLAW) – Managing system at risk, Food and organization of the United Nation, Rome and Earthscan, London, ISBN-13: 978-92-5-106614-0, 2011. Garreaud, R.: Multiscale Analysis of the Summertime Precipitation over the Central Andes, Mon. Weather Rev., 127, 901–921, https://doi.org/10.1175/1520-0493(1999)127<0901:MAOTSP>2.0.CO;2, 1999. Garreaud, R., Vuille, M., and Clement, A. C.: The climate of the Altiplano: observed current conditions and mechanism of past changes, PALAEO, 194, 5–22, https://doi.org/10.1016/S0031-0182(03)00269-4, 2003. Gutiérrez, C. B. and Molina, C. J.: Final report: Balance hídrico y escenarios de cambio climático en el lago Titicaca, Project: Fortalecimiento de Planes Locales de inversión y adaptación al cambio climático en el Altiplano boliviano, IDRC-CRDI, Agua Sustentable, La Paz, Bolivia, https://doi.org/10.13140/RG.2.2.24230.22083, 2014. Lhomme, J. P., Vacher, J. J., and Rocheteau, A.: Estimating downward long-wave radiation on the Andean Altiplano, Agr. Forest Meteorol., 145, 139–148, https://doi.org/10.1016/j.agrformet.2007.04.007, 2007. López-Moreno, J. I., Morán-Tejada, S. M., Vicente-Serrano, J., Bazo, C., Azorin-Molina, J. I., Revuelto, A., Sánchez-Lorenzo, F., Navarro-Serrano, E., Aguilar, E., and Chura, O.: Recent temperature variability and changes in the Altiplano of the Bolivia and Perú, Int. J. Climatol, 36, 1773–1796, 2015. Maidment, D. R.: Handbook of Hydrology, Mc-GRAW-HILL, INC., ISBN-13: 978-0-07-039732-3, 1993. Marti-Cardona, B., Streissberg, T. E., Schladow, S. G., and Hook, S. J.: Relating fish kills to upwellings and wind patterns at the Salton Sea, Hydrobiologia, 604, 85–95, 2008. Penman, H. L.: Natural Evaporation from open water, Bare Soil and Grass, P. Roy. Soc. A-Math. Phy., A193, 120–145, https://doi.org/10.1098/rspa.1948.0037, 1948. Pillco, Z. R. and Bengtsson, L.: Long-term and extreme water levels variations of the shallow Lake Poopó, Bolivia, Hydrolog. Sci. J., 51, 98–114, https://doi.org/10.1623/hysj.51.1.98, 2006. Pillco, Z. R. and Bengtsson, L.: Doctoral theses: Response of Bolivian Altiplano Lakes to Seasonal and Annual Climate Variation, Lund University Publications, 1, 107 pp., 2007. Pouyaud, B.: Lago Titicaca, Programa estudios TDPS: misión d'evaluation sur la prise en compte de l'evaporation, GIE Hydro Consult International, GIE ORSTOM-EDF, 1993. Revollo, M. M.: Management issues in the Lake Titicaca and Lake Poopó System: Importance of development a water budget, Lakes and Reservoirs: Research and Management, 6, 225–229, https://doi.org/10.1046/j.1440-1770.2001.00151.x, 2001. Richerson, P. J., Widmer, C., and Kittel, T.: The Limnology of the Lake Titicaca (Perú-Bolivia), a Large, High Altitude Tropical Lake, Institute of Ecology Publication, 14, 82 pp., 1977. Roche, M. A., Bouges, J., and Mattos, R.: Climatology and hydrology of the Lake Titicaca basin, in: Lake Titicaca a Synthesis of Limnological Knowledge, edited by: Dejoux, C. and Iltis, A., Kluwer Academic Publisher, 63–88, 1992. Satgé, F., Espinoza, R., Pillco, Z. R., Roig, H., Timouk, F., Molina, J., Garnier, J., Calmant, S., Seyler, F., and Bonnet, M.-P.: Role of climate variability and human activity on Poopó Lake droughts between 1990 and 2015 assessed using Remote Sensing Data, Remote Sens., 9, 1–17, https://doi.org/10.3390/rs9030218, 2017. Singh, V. P. and Xu, C.-Y. : Sensitivity of mass transfer-based evaporation equations to errors in daily and monthly input data, Hydrol. Process., 11, 1465–1473, 1997. Talbi, A., Coudrain, A., Ribstein, P., and Pouyaud, B.: Calcul de la pluie sur le bassin-versant du lac Titicaca pendant l'Holocène, Comptes Rendus de l'Accadémie des Sciences, Paris, Sciences de la Terre et des Planètes, 329, 197–203, 1999. Taylor, M. and Aquize, E. A.: Climatological energy Budget of the Lake Titicaca (Peru/Bolivia), Internationale Vereinigung für Theoretische und Angewandte Limnologie: Verhandlungen, 22, 1246–1251, https://doi.org/10.1080/03680770.1983.11897478, 1984. TDPS: Climatología del sistema de los lagos Titicaca, Desaguadero, Poopó y Salares Coipasa y Uyuni (TDPS), Comisión de comunidades de europeas, Repúblicas del Perú y Bolivia, convenios ALA/86/03 y ALA/87/23, LP, Bolivia, 1993. UNEP. : Diagnóstico Ambiental del Sistema Titicaca-Desaguadero-Poopó-Salar de Coipasa (TDPS) Bolivia-Perú, División de Aguas Continentales del Programa de las Naciones Unidas para el Medio Ambiente y Autoridad Binacional del Sistema TDPS, Washington, DC, USA, p. 192, 1996. 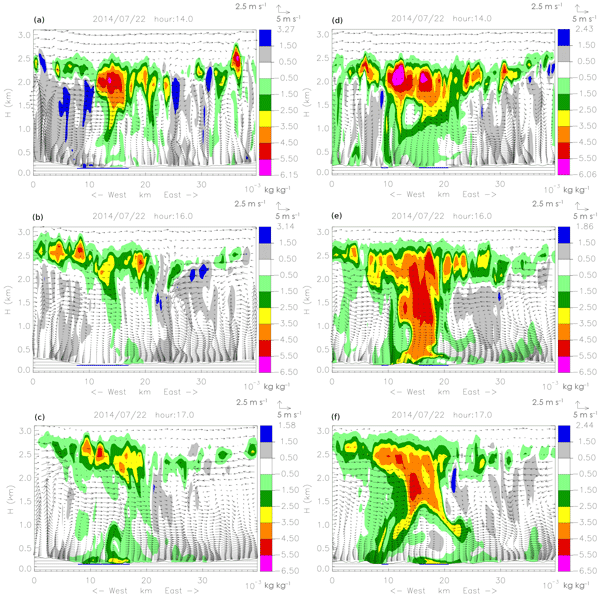 Vuille, M., Radley, R. S., and Keiming, F.: Interannual climate variability in the Central Andes and its relation to tropical Pacific and Atlantic forcing, J. Geophys. Res.-Atmos., 105, 12447–12460, https://doi.org/10.1029/2000JD900134, 2000. Wirrmann, D.: Morphology and bathymetry, in: Lake Titicaca, In a synthesis of Limnological Knowledge, edited by: Dejoux, C. and Iltis, A., Monographiae Biologicae, 68, Kluwer Academic Publisher, Dordrecht, 16–22, 1992.